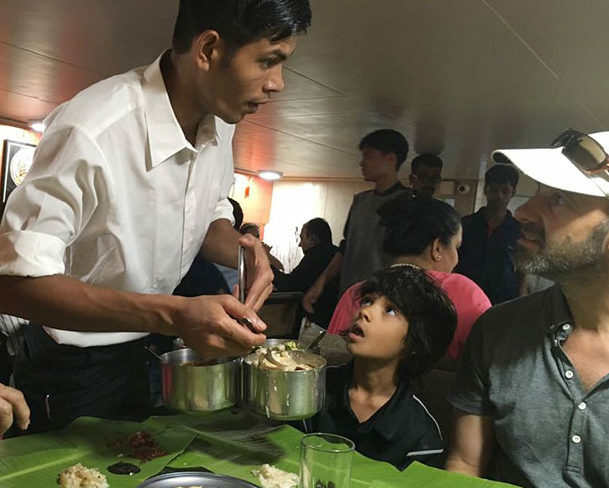 Kate Underwood recently spent a deliciously rewarding holiday in Vietnam. 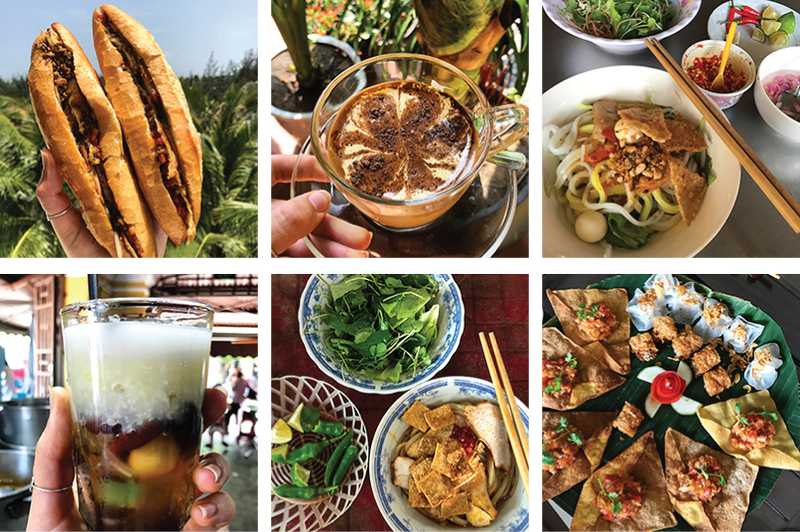 She shares her six top Hoi An food experiences here (pictured left to right above). I managed to average about one Banh Mi per day in Hoi An, and Madam Khanh – Banh Mi Queen served some of the best and most popular in town. The ‘mixed’ or Thap Cam version was my go-to. Crunchy French baguette filled with pate, pork, ham, slices of egg omelette, cucumber, fresh herbs, mayonnaise, papaya salad, chilli sauce and the signature ‘egg sauce’ – a magical elixir that had me transfixed. Sold for just $1.25 each and eaten on the balcony of our beautiful Hoi An resort. Bliss. My morning fix with a twist – the infamous Vietnamese Egg Coffee. Strong black coffee topped with a whipped egg yolk and sugar concoction, dusted with chocolate powder. An utterly rich, decadent, creamy, sweet and luxurious beverage masquerading as dessert. It reminded me of an affogato with melted French vanilla ice cream, and made the original Vietnamese coffee with condensed milk taste bitter in comparison (and that’s saying something). Skipping the resort buffet for a breakfast bowl of Mi Quang in a local’s home is one of my favourite Hoi An memories. I steadily made my way through rice and turmeric noodles with pork, shrimp, peanuts, fresh herbs, a toasted sesame rice cracker and two quail eggs, all served with a bowl of salad greens and herbs – including banana blossom, lime, chilli peppers and pickled baby onions. 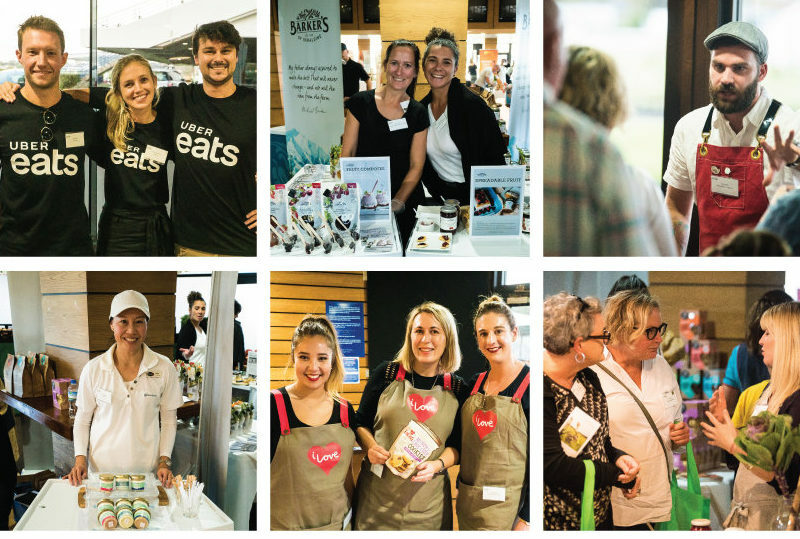 My hosts and fellow diners watched as I ate, intrigued to see if I liked their local dish – after loads of gesturing, smiles, thumbs up and an empty bowl, it was clear. 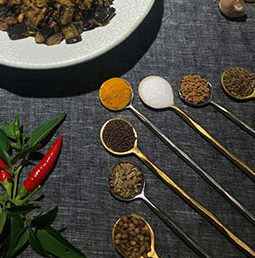 There is nothing quite like that magical connection that can only be found over a bowl of lovingly prepared food. I vividly recall sipping and spooning precariously on this tall glass of Che Cap Tam. A seemingly crazy concoction of ice, lotus, corn, jelly, black bean, snow beans, tapioca and coconut milk, it was a sensationally sweet, refreshing and multi-textural beverage. It looked a little like a Vietnamese traffic light, full of varied gelatinous components, with each mouthful providing a dramatic contrast from the last. I watched as the locals chose their own favourite variations, devoured them at record speed and drank complementary green tea to follow. Another local specialty is Cao Lau: pork slices, greens/herbs, brown noodles, fried pork rind, bean sprouts and chilli, then add your own lime and green chilli. Local lore says the thick, chewy rice noodles must be made from lye water collected from a secret and ancient well just outside of Hoi An Town. Perched at a plastic table at the Cua Dei market I sat down to this $1.85 bowl of delight, quickly joined by a local man. We shared slurps and awkward glances while the Vietnamese women walking past giggled and made remarks such as ‘he your husband? !’ in broken English. A platter of Hoi An specialties from Dau Viet Restaurant including: Hoanh Thanh Chien: fried wontons filled with pork, shrimp and tomato salsa; Cha Gio: spring rolls with lattice paper filled with pork, carrot, mushroom and celery; Banh Bao: white rose dumpling – small shrimp dumplings with fried shallots and a tomato-skin rose crafted for presentation. A smorgasboard of crispy, crunchy and chewy elements; different textures are a key part of Vietnamese cuisine. This spread was part of the fabulous Original Taste of Hoi An food tour, which I can’t recommend highly enough – if Hoi An is on the travel list, be sure to make this part of your itinerary.